Summer Card Camp 2013! And a giveaway! 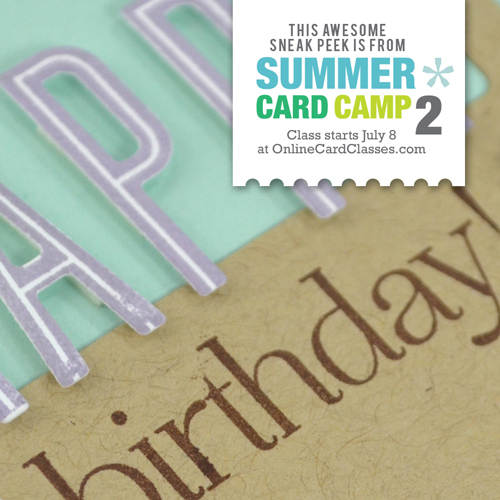 I was so thrilled to be asked to participate again in the amazing Summer Card Camp online event! I hope you will take this opportunity to read over the details below and hurry on over to register today! Join your Online Card Classes Summer Camp counselors—Kristina Werner, Jennifer McGuire, and friends (including me! )—for a three-week adventure packed with cardmaking ideas! Each day, you’ll discover a new way to have fun with your cardmaking supplies, whether we’re exploring a color combo, transforming a design sketch, or learning a new technique together. Summer Card Camp 2 includes designs from over 40 guest artists (yay! ), lively videos, PDFs containing step-by-step instructions, shopping discounts, and loads of giveaways! Plus, you’ll have lifetime access to all of the class content—talk about making that summertime feeling last! Summer Card Camp 2 runs July 8-29. Sign up now for only $35! Just CLICK HERE! Leave a comment today and let me know how excited you are about this fantastic learning opportunity and I will select one winner to recieve Summer Card Camp 2 registration for free! This contest will close at 8am EST tomorrow (July 3rd) and I will announce a winner here later that afternoon! Thank you for allowing me to share this with you and best of luck with the contest! Congratulations to Marge R. (mer)! She has been randomly selected to win the complimentary Summer Card Camp 2 registration! Someone from Online Card Classes will be in touch with you about all the details! "I NEED this class, as I feel so lost when it comes to paper crafting creativity lately. My mojo's gone missing and I've been playing nurse/driver/all-around do-er since my hubby had his shoulder replaced and then got bronchitis. I need a 'spark' to get me motivated again!!!" I would love the chance to win! This would be so exciting, I have not had the chance to participate in online classes yet. I would just love it! I loved the first card class I took Pattern Play. The videos, tutorials, photos and tips are so informative and so well done. Thanks for the chance to win the Summer Camp class! would love to be the winner – have really been inspired by all these classes in the past – so many fun ideas. I’d be interested in taking some of their classes again. Thank you for the opportunity to win it! It would be amazing to win this class! Thank you so much for offering the chance. These classes are new to me. They look very intriguing. I would love to win this class 🙂 Thanks for the chance! I would love to participate in this card class and appreciate a chance to win! Fantastic! I would be so happy! Ohhhhh I’d love to win a spot! I would love to participate. Thanks so much for the chance to win! This class sounds awesome! I would love to participate! Thanks for the chance to win!!! This class would be a great opportunity to learn some new techniques. These classes are always great! Thanks for the chance to win! The Online Card Classes are fantastic! Looking forward to this new one :). Sounds like a great class. Thanks for the chance to win a spot. I’ve never tried an online class, but seeing all the Papertrey instructors, I think this would be an awesome class – 3 weeks of high intensity inspiration!! Count me in!! I would love to take this card class! What a wonderful line up of instructors. The class looks awesome! Would love to win a spot! Hoping to win a spot in this class. Thanks for the opportunity! I have not tried this but it sounds like a great way to learn! I’d be soooo excited to be a part of this class! It looks like FABULOUS fun…perfect summer fun! Thanks for the chance to win, Nichole! The class sounds amazing! I’ve been wanting to take one of these classes and they are on my radar screen for sometime in the future when I can afford it. Thanks for the opportunity to win a spot! I love the Online Card Classes. The teachers are top-notch and very inspiring! I love anything PTI offers. I would love to take this class. This card class looks awesome- thanks for the opportunity to win a space in the class! I am SUPER DUPER excited!!! I would so love to be able to take this class! Thank you for the chance! I know this class would teach me a lot of things. This card class would be a great learning opportunity for me. Thanks for the chance to win. I really enjoy the Online Card Classes. They are jam packed and I always learn so much. it would be GREAT to win a spot in this class. Thank you for the opportunity! This would be just the thing to get my creative juices flowing. Thanks for the chance to win! Awesome to know you will be one of the instructors! !I’d love to win a spot! What a great lineup! This sounds like a ton of fun and I would be thrilled to participate. j’aimerais bien avoir la chance de gagner ! Oh, what a fun giveaway!! I would LOVE to win a spot and get some inspiration from all the fabulous teachers … Thanks for the chance to win! I think this would be a grand time and I would love a chance to participate! I am so tickled that you’re joining the slate of teachers. I LOVE these online classes and will NOT miss this one. I signed up right after the last class ended. I loved pattern play, the videos were great! This class would be a great opportunity to learn some new techniques with some awesome instructors!! What a fantastic and challenging opportunity it would be to take part in this online card class. It looks so exciting and would definitely be a much needed shot of creativity to the system for me. Thanks for the chance to win and good luck everyone! always love to learn more about this great hobby! Three weeks of awesomeness! Pick me! I would love the chance to attend this card class series. Heaven knows I could use some help, lol. Have never taken an online class – would love for this to be my first! This is going to be a wonderful class and I would love to win a spot!! I haven’t miss a class yet. They always inspire me with such great tips, techniques, and ideas. I can’t wait! It’s gonna be great ( as Tony the Tiger says). This class looks awesome! Thanks for the chance to win a spot. I love on line classes! I am a stay at home mom and on line classes work perfectly into MY schedule. I would love to win! Hi, I am extremely excited at the thought of being able to do this class. All the folks teaching are fantastic and I am at home a lot as my children are unwell and don’t go to school so online learning is pretty much the only type of class I can take. I’ve never taken an online class. Would love to win. Thank you for the chance. How exciting to have a chance to win a spot in this card-making class!!! This would be so fun and inspiring, and learning from my favorite instructors the best part!! I would love to take this class and how exciting that you will be part of it! Thanks for the chance to win. Thanks for giving us a chance to win! A class full of amazing designers?! That’s awesome!! Thanks Nichole, for the chance to win a spot in the Card Camp! Would love this so much! I am so ready for Summer Card Camp! Thanks for the opportunity to join in the fun! I would love to win this. These classes are so amazing and full of inspiration. I have never taken on online card class. What a neat opportunity! I love these online card classes and would love a spot in this one! Thanks for the chance to win! I would so love to win this! These classes are amazing! Thanks so much for the chance to win! I attended last year’s Summer Card Camp and it was AWESONE! Thanks for the chance to win this year’s session. This class looks awesome! I need some inspiration! I would love the chance to take this class. Thank you! This sounds wonderful. Thanks for the opportunity to win. I would love a chance to win a spot. O so to win. Your work is awesome and thanks for the chance. Want it, need it, please! Looks like an amazing class! I would love the chance to win! I love these classes. Living in Australia I know I will never get to a chance to see all you lovely talented ladies in person so winning a class would be fantastic. This would be so exciting, I have not had the chance to participate in any online classes yet. I would just love it! Thanks for the chance to win!! Sounds like a great class! Thanks for the chance! I would love to win this chance for a free spot in the online Summer Camp 2 class. The line up of instructors is truely amazing. This class sounds fantastic! Would love to win a spot and learn all sorts of new craftiness! Summer camp for grown-ups! Oh, this could be just what I need to survive summer vacation. Would loveeeee the opportunity to be exposed too all the amazing creative talent. Please pick meeeeeee!!! Your sneak peek card looks amazing! I am a big fan of your style! Would love to win a spot in this fabulous class and learn some new techniques! Thanks for the chance to win! Oh, this sounds exciting. I’ve never taken an online class before, sounds like great “me time”! Thanks for the chance, Nichole! YES!! I have taken some Online Card Classes and they are fabulous…and now YOU, my most favorite inspiration of all is part of it! How Awesome is that? Thank you Nichole for a chance to win the class for free!! Love these classes. Thanks for an opportunity to win tuition. I’m glad to see you’re part of this wonderful group of artists. I’m looking forward to this class as the previous classes I’ve attended. I’d love to take this online class- thanks for the chance to win. The first Card Camp was fabulous so I know this one will be great too! Can’t wait! I am sure this class will be amazing! It has amazing teachers ~ including YOU!!! I don’t know how this could be but I’ve never heard of this before! Sounds like amazing fun! I would love to try it! These classes are great. Would love to win a spot. What a wonderful opportunity – so generous of you to make it available. I’ve never taken an on-line class before, and it would be awesome to win a spot in this card class! Sounds like a lot of fun!! Thanks for the opportunity! I would love to do this! It would be perfect timing to do while my kids are in summer school all of July! I would love to take this class it sounds like so much fun . All the instructors are awesome! Thanks so much for the chance to win! I have always wanted to take the Stamp-A-Faire class but last year we were on vacation at that time and guess what we will be on vacation again this year at the time of that class. But I will not be gone for this class, I would love to win this, it sounds like to much fun. Thanks for the chance to win. Sounds like an awesome class! I am beyond excited! I have taken their classes before and they are wonderful! I would love towin. I would love to win this summer camp. What a wonderful idea! Can’t wait for all the fun, sounds fantastic! Oh how fun!! Sounds like a great informative class. I have never done an online class but would love to try one. Thanks for the chance!! Oh, how I would love to win the class!1 Such an opportunity. Thanks so much for the chance. Loves these classes and teachers. This would be wonderful thank you so much for my chance to win a spot! These classes sound fantastic. Thanks for the chance to win a spot. For a long time now, I have been toying with the idea of signing up for a card class. I would love to have the chance to take this class, especially as many members of the PTI team are instructors. Sounds exciting. An online card class would be so cool. Isn’t modern technology wonderful. What an awesome opportunity to learn from such a great group of talented ladies! I have not taken an online class….would love to give it a whirl!! I’m so excited that you will be a part of Summer Card Camp 2!!! Thank you so much for a chance to win a spot in class, Nichole! All of their classes have been awesome, and I can’t wait for this one to start! WaHooo….Yippy Skippy….Oh boy, oh boy, oh boy….YaHooo…..WeOooo WeOooo WeOooo….ChaChing….Clicking my heels….Slap Happy with Joy….Jumping up and down with excitement. I love the variety of the class themes and that each card pretty much comes with a video tutorial (I learn better visually :D). I can’t wait to try some of these out and I’d love to win a pass! This sounds like a ton of fun and inspiration with a lot of talented ladies! Thanks for the giveaway. I NEED this class, as I feel so lost when it comes to paper crafting creativity lately. My mojo’s gone missing and I’ve been playing nurse/driver/all-around do-er since my hubby had his shoulder replaced and then got bronchitis. I need a ‘spark’ to get me motivated again!!! I love these card classes! I learn so much and get so inspired at the same time! I’d love to win this and thanks for the chance! Oh wow do I need this! I’m a newbie and need all the practice and help I can get!! Would love to win a spot in this terrific class. These instructors are terrific…Have taken most the previous online classes. And I’m thrilled that you are a part of it. I want to go to camp. No packing, no sunburn, just the fun! I’ve already registered but I’d love to get a free spot for my daughter! Thanks for the chance to win. I can’t wait for this class to begin! What a great opportunity! I would love to take this class! This class looks fantastic! Thanks for the chance to win! WOW! This card class sounds amazing! I am super excited to have a chance to participate! I love these classes. Thanks for the chance to win, Nichole! Thanks for the opportunity to win! Sounds exciting! Oh how exciting! I would love to win a chance to learn from these inspiring instructors! Thanks for the opportunity! What a great idea! I would love to take this online class! I would love a chance to win a spot in this class! I would love the opportunity to win!! I am always in such awe of you and Jennifer McGuire!!! Thanks for the chance to win. How exciting! You have the most talented DT. I would love a chance for this class. THANKS! I would be thrilled to learn from the experts! What fun! Love to join the fun! Thanks for the chance to win a spot. This would be a wonderful prize to win plus the opportunity to be inspired by a great line-up of instructors. How fantastic would this be? Learning from the best. I LOVE these classes! You all have such inspiration and creativity to share! Thanks for the chance to win a spot! wow what a cool line up of instructors!! Sounds like great fun!! Can’t wait!! I would love to go to summer camp with these ladies! Thanks for the chance. I am always in AWE of all the creative inspiration the entire Papertrey Ink design team has to offer. I also am equally inspired by Kristina’s work. To be a part of the stamp camp would be awesome. Thanks for the chance to win a great prize!! Sounds like fun! Sounds like a great class! Thanks for the chance to win. I’d love to join a class with such elite instructors! Sign me up!! I love these classes. You are a great addition! I took SC1 and loved it! I’d love to win a spot in SC2!!! Thanks for the opportunity to win a spot! Would love a chance to win and learn so much…Thank You! I’m definitely excited! Love to see what you have in stored. Thanks for the chance to win. I’d love to win a virtual trip to the Summer Card Camp!! I’ve wanted so much to take this last year, but couldn’t swing it! Thanks for the chance to win! I would love to take this class. Thanks for the opportunity to win. Thanks for the chance to win a spot in this class. I would love to win a spot in class! Thanks for the chance to spend time with such great teachers. I would LOVE to win a spot in this class! Summer Card Camp sounds heavenly! Love these classes … And I appreciate the chance to win a spot. Thank you very much. I would love to take this class. I hope I win. Thanks for the chance. It would be thrilling to win a spot in this class. How exciting you are participating again. I would love to win a spot in this class. You guys are my FAVORITE card designers! Thanks for the opportunity to win! I have always wanted to attend a card class – thanks for the chance to win. When I see the list of “teachers” this has just to be a fabulous class! I’ve taken the Summer Camp Card classes before and they are GREAT!! I’d love to win and get the class for free! I would love to win this! It sounds amazing. I took their Pattern Play and His & Hers classes. They were awesome. I’d love a to take this class as well. Thanks for the opportunity to win. I love the on line card classes and I especially love your blog and products so this will be one of the best!! I so hope I win! I would love to win a spot in this awesome class. I have been followers of Kristina & Jennifer for years and know they are incredibly talented. Thanks for the chance. Wow, this class keeps getting better. Would love a chance to win a spot. What an awesome concept. Thanks for offering the opportunity to join in on the fun. All of you girls are so inspiring! Would love to win this fantastic class! This looks like a terrific class – thanks for the opportunity to win! How excited am I? VERY, Very, very excited! 🙂 Thanks for the chance to win. Oh,what I could learn from this group!! These classes are always fantastic! So glad you are participating! I would love to win a spot in the class! I am so excited about the next summer card camp. I would love to win a spot! Oh my! What a fantastic opportunity! I would love to be able to participate and take this class with these great instructors. Thank you for a chance to win! I did the card camp last year and really enjoyed it. Would love to win a seat in this year’s session! How exciting, what a wonderful chance to learn some new techniques from such great instructors! Thanks for the chance to win! I would be thrilled to win this! I ‘m sure these classes are very informative & alot of fun! I clicked my heels three times! Hope I win! I’d love to have this class! I’m sure there’s lots of stuff to learn….Also, I’m staying at home during summer vacation so I would have something to look forward to. Thanks for the chance of winning a spot! I really want to take this class. It would be super-dooper great to win it! Thanks for the chance, Nichole! I would love this class with the lineup that is in place! Looks like a really great one. Thanks for the chance to win! i love to win a spot…the line up of instructors is amazing! I took this class last summer and it was AWESOME! Can’t wait for this year’s class to start! So happy you are a guest teacher! Thank you for the chance to win! I would lovebto win this class. It looks like a lot of fun! This sounds like so much fun! I would love the chance! wow, would love to take this class, I love all the instructors too!! !thanks for a chance to win. Card camp looks so awesome. Would love to participate. So excited another Card Camp is on the way!! Would love to win! Thank you! What an amazing class. It is such a great opportunity to learn a lot of techniques. Thanks for a chance to win. I’m so glad you’ll be a part of it! Would love to play along! Thanks for the chance to win! I am so excited to take the class and also with the inclusion of Papertrey Ink instructors! I’d love a freebie! Excited about this class – can’t wait to see your full project. Thanks for the chance to win. OMG!!! I’ve been trying to WIN a Spot since it was announced. This would be Super Exciting to learn from some of the Industry’s BEST Crafters. Woo Hoo! How awesome! I would love to take this class. This would be great inspiration to get me stamping again after being away from it for months! this would be amazing, thanks! What? My favorite designers teaching summer school? Count me in! Sounds wonderful! Ooh that sounds like so much fun. I would love to do this with my daughter! Thank you for the chance to win! I registered a long time ago. At least it seems like a long time! I can’t wait for it to start. I participated in one other class with Jennifer and company and loved it. Would really love to win a spot in this one. It sounds fantastic! Thanks for the chance to win. Looks like a fun class. Pick me! Pick me! Pick me! I would love to be a part of this card class!!! I am currently laid up with a broken foot, no weight on it for 6 long weeks. This would be a perfect escape! Fun!!! I would love to take a card class with you rock stars! Thanks SO much for the chance to take it. I have seen info on this class already & think it sounds like the perfect way to spend hot summer afternoons! Thank you so much for the chance to win! So fabulous that you will be teaching! Sounds like a blast. Would love to win and play along. Oh I would love to join in in this event. What fun it would be and to have access to all this talent. Fingers crossed. I would love to win a seat in this class! Thanks for the chance to win! Would love to be a part of this class! Wow, what a great idea! I’ve never tried an online card class. It looks like a lot of fun! It would be so much fun to win a spot in this class so I could learn so many different things with the stamps and inks that I have now and if I have to go buy more new stuff then that’s a major plus to me!! I have never done an online class but would love to!! Great talent there! Thanks for the chance! The camp sounds like loads of fun! This class sounds amazing. I would live to be picked for this class. These are always the best classes, with the best people! Hope to win this one! Sounds interesting…I would love to win! They were smart to pick you for an instructor! I’d love to attend Summer Camp! sounds awesome! I will hope to win the opportunity. I would love to learn new techniques! Hope I win! This sounds like an amazing card class and thank you for the opportunity to hopefully participate in this class. sounds like a fabulous online class! wow, all of my favorite people in on spot! What a line up of talent! I appreciate the opportunity to win! Thank you! Congrats, Nichole, on being one of the camp counselors for this class! It sounds like an awesome class and would be beyond thrilled to win a spot. Thanks! I am already signed up for this class but would love to win a spot! Thanks! This is very exciting! Would love to win. Thanks for the chance! Ooops. Not sure if that worked…. Trying again. Thanks for the opportunity !! Would love to win a spot in the upcoming class. I would love to win. Thanks so much for the chance to win a spot, Nichole! Super! Have been waiting for this camp again! Thank you for the chance to win. Summer Camp and the Faire! WOW – this is turning out to be a really wonderful summer! Thanks for the chance to win Nichole. Wow, what a great line up of instructors! Would love to win a spot in the OCC! Thanks for a chance! Summer camp would be so much fun and knowing I’d be making cards instead of rowing a canoe would make it extra special! I might make some ‘smores though for a snack while making cards! What a cool class. Thanks for the chance. This is so cool. I love how technology makes it so easy for people to learn and share ideas from all over the country. I’ve never done an online card class so this would be a great opportunity to try one out. I’m always looking for ways to broaden my creativity and learn new techniques. I didn’t much care for summer camp when I was a kid but this one sounds like so much fun. I can hardly wait for class to begin! Thanks for the chance to win!! Woohoo!! I have loved all of their classes. I know I would learn so much from this one too! It must be Christmas in July! I would learn so much from such talented teachers. Thanks you so much for the opportunity to win such a great prize! I’d love to win a spot!!!! Thanks for the chance! What a great giveaway! I’m sure this will be one amazing class. Thanks for the chance to win. So excited about Summer Card Camp, there are so many amazing designers. Should be a blast. Thanks for the opportunity to win! A fantastic line-up of instructors and guests! Thanks so much for a chance to win a spot! I would love to go to Summer Card Camp. I have taken online classes before and they are always packed with new ideas and lots of inspiration. Thanks for this chance to win. If you are involved I know it will be good–would love to win a slot! Online classes like this are not only instructional but great fun. Thanks for the chance to win. I’m soooo ready for this class. It looks like lots of fun! Thank you so much for the chance to win, I’d love to take tis class!! Looks amazing!! Can’t wait to learn some new techniques!!!! This class would be great to help me get more use out of all the stamps I have. This would be great to win!!! I am always excited to see new examples and learn new techniques for my cards! Thank you for doing this. Thanks for the chance to win! Sounds like a lot of fun! Pick Me! Pick Me! It would be awesome to win this class! Thank you so much for offering the chance. Looks like a great class! Thanks for the chance! Oh my! I would love to get to do this! Sounds so fun. Crossing my fingers. 🙂 Thanks for the generous gift even if I don’t win. This class is just what I need to get me out of my summer doldrums! This sounds like a terrific class. I would love to take it! My son just came back from his first trip to summer camp for kids with Asperger’s syndrome. I think it’s my turn to go to camp now…..Card Camp!!!! I would sooo love to win a spot! Will there be S’mores?!?! Yum! I would be so excited to win a place in this class. Thanks so much for the opportunity. Would love to win a spot in the class! I would love to take this class. I am in desperate need of inspiration! The online card classes are great! I would love to win a spot in this class. Thanks for a chance! I would love to win a spot. Thanks for the chance. I really need a reason to clean my stamp room! Would love to win, looks like fun. Sounds like a great class! Thanks for the chance to win! I love Summer Camp! Hope I can play along. thanks for the oportunity to win! This class sounds like a “stay-cation”! So fun! I would love to be a part of this card class….thanks for the opportunity to participate! Far…. Would love to win a spot!!! This would be amazing! I will keep my fingers crossed. Thanks for the chance. would love the have the chance to take this class…thanks ! I would be thrilled to learn to make cards from three of my favorite teachers! I need all the help I can get, so this class is up my alley! Thank you for the chance to win! I would be thrilled to win a spot in the class – I have never done anything like that before and it sounds awesome! A chance to learn from the best – what a fantastic opportunity! Looks like a great class! Thanks very much for the chance to win! This class looks wonderful because there is such a variety of designers! I can’t even imagine how many things I would learn!!! There’s so much I’d like to do and don’t know where to start! Would love the inspiration from a card class! I have been wanting to sign up for this. Would love to win a spot! I would love to win free registration to this card class! I love learning new techniques! It feels like I signed up for this class months ago so I’m really looking forward to all the inspiration I’ll get when it starts. Sounds like a really great class. Thanks for the chance. I would be thrilled to win! I got so much out of the last 2 classes. This class, I am sure, will of the, if not better same quality! This would be a first for me! So exciting! I would love to win a spot – esp. since you are one of the instructors. I took the most recent class (His and Hers) and have been so impressed. Thanks for the giveaway and have a great day! Since I have been in a major creative slump for months, this class would be awesome to get a kick start back. Thank you for the chance to win. This class sound wonderful and I would love the opportunity to have a place. I would love to join this online class. Great teachers and so much inspiration. Thanks for the chance. Can’t tell if my previous comment posted. I am super excited about this card class. Thank you for the chance to win. I really need this camp as I am in desperate need of motivation and inspiration. Thanks for the opportunity! This would be over the top, exciting to participate. Especially if it’s for free! Please enter my name into your drawing. Thanks so much! I´ve never join an online class but i´m sure it´s fun. Thanks for the chance to win. I’m sure it would be lots of fun to join the online class!! It’s just awesome! How exciting for you! I would love to win a class as I have never taken an online class before. Thanks for the chance to win! Would love to win a seat at the class! Thanks for the chance!! It would be so awesome to win! I loved the first class! Thanks for a chance to win! This class looks really fun! I would love to win a spot! Thanks for the chance!! I would love to take this class! I’ve never taken a online class, and I’d love the opportunity win a spot in this class! My card-making mojo needs some serious help, and the inspiration I’d gain from something like this would be immeasurable and very appreciated! I took the class 2 years ago and LOVED it instantly! I still refer to the lessons when I find myself in a rut, and would love to have fresh ideas to keep the creative juices flowing!! I took the pattern play class and loved it! I am excited about this one too! I would love to take this class! Love their classes–thanks for the chance. I would love to be in a class taught by three of my favorite stampers. Thanks for the chance to win free registration. I would love to win, thanks for offering! This is so exciting, knowing PTI designers are so well represented at this class! Thanks Nichole! What fun for the summer. I’m sure there will be a lot of great inspiration ! This sounds like an awesome class with some fabulous instructors. I would love to win a spot in this class. Thanks for the opportunity! I would love to win a spot in class! Thanks! I took the previous card class and it was terrific. Glad you are joining. Looking forward to it! I would love to win!! I have never taken an online class! I will love to win, hop it’s still open. How exciting! I have never taken an online class before and I would love to participate in this one. Thank you for the chance to win. I would love a chance to win! i have been wanting to take a class. Thank You. I am so excited for this class considering all of the amazing talent they have recruited for it! Especially the PTI girls!!! I would love the opportunity to win and participate in this case. Thank you for the chance Nichole! This sounds like a great class. Thanks for the opportunity to win ! Thanks for the chance! Would love to win a seat and step up my cardmaking skills! So glad to hear that you will be one of the teachers for the Summer Card Camp 2. Know you will present some inspiring cards and show some great techniques! Can’t wait!! Would love to take this class. Thanks for the chance to win! Thanks for the opportunity to win it! I would love to win a spot in this awesome class. A reason to spend time with the Papertrey ladies? Count me IN! It would be marvelous to win a spot in this Summer Card Camp class with you, Kristina, Jennifer and the other superb instructors. I’ve taken several of these on-line card classes and love them all. Each of these classes just get better and better with very talented instructors. I really appreciate the opportunity to win a spot on this next one. Sounds like so much fun I wish I could afford it I would register now!! Would love to Win! I LOVE OCC… Jennifer and Kristina are GREATNESS! Camp looks like so much crafty FUN!!! Would love to win a seat! This looks a real treat! Thank-you for the opportunity! All of these superstar instructors in one place is just WOW! Thank you for the chance to win a spot in this class, Nichole. Wow! Papertrey Ink and Kristina Werner! Talk about awesome! I’d love to win. Oh, PLEASE PLEASE pick me! I want to take this class so badly! Thank you for a chance to win a spot! I’ve admired these classes but never taken the plunge. Thanks for the opportunity to win a spot. Love the country scene card, the colors look so rich!